11 Fabulous Years—Thank You For The Memories! Kathie Lee, weekdays won't be the same without you! We'll miss Kathie's sweet-natured spirit and contagious smile on the fourth hour of the "Today" show, although we know there's more to come from this modern-day renaissance woman. 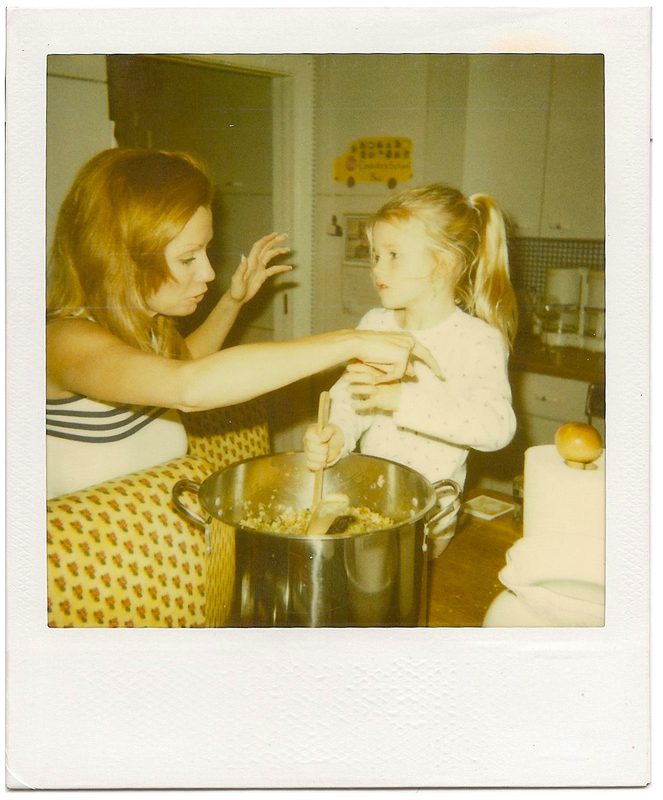 We can't wait to share all of the future Kathie Lee sightings with you, her GIFFT fans. Discover new ways to share in the magic of the season! From taking time for yourself to giving back to others, create a new tradition to enjoy each December for years to come. Enjoy festive music! Check out a community concert or musical, or simply curate a favorite holiday playlist to enjoy at home. 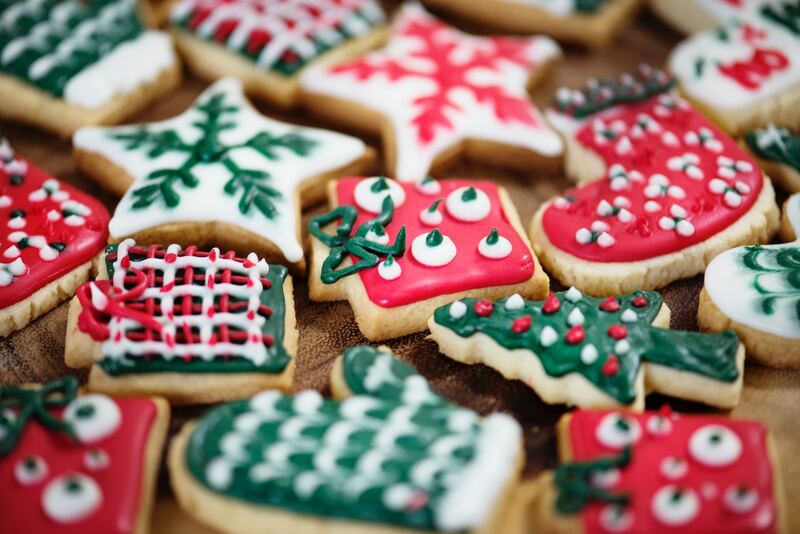 Enjoy time in the kitchen whipping up traditional favorites your family and friends count on, or try a recipe that will become a new go-to sweet treat. Find joy in decorating your own home this season, as well as lending a hand to someone in need. You probably know someone who should take it easy and stay off ladders, or who would truly appreciate the decorating help. Order your favorite bottles of GIFFT for entertaining and gifting. We’re offering 1-cent shipping on 2+ bottles through December 11, 2018. Host a holiday movie marathon. Enjoy classic Christmas films such as It’s A Wonderful Life, A Christmas Story or A Charlie Brown Christmas. Check your local television listings for featured holiday films as well. Walk or drive to see holiday lights at night! Pick an area with concentrated décor for ease of viewing and pack a thermos of hot chocolate or coffee to enjoy. While you’re out scoring holiday shopping deals, why not pick up items for those in need? 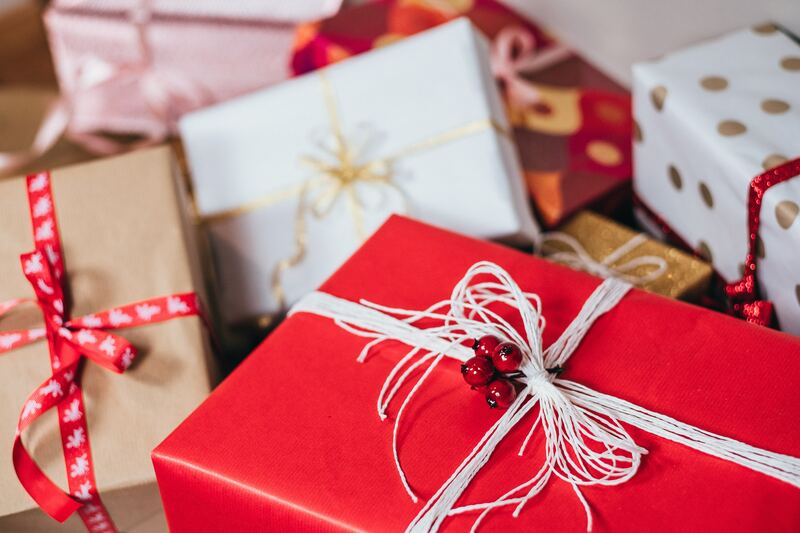 Many community organizations sponsor families, deliver meals, collect clothes or toys, or host visits to veterans or assisted living facilities. 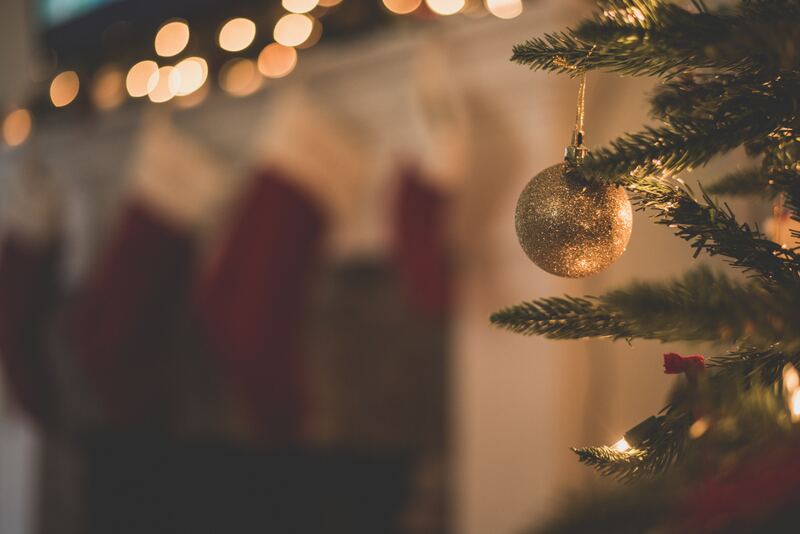 Connect with family and friends simply this season. Host a casual breakfast (invite them to come in pajamas if they like!) with coffee, juice, pancakes, eggs or pastries. Keep it simple and focus on your time together. Head outside for fresh air no matter the weather! Have a white Christmas? Enjoy! No snow around? Many communities (even near our winery in California) have ice skating rinks to give you all the holiday feels. Carve out some time for yourself to refresh and recharge! Sneak away for a walk outside, attend a favorite class at the gym, or take yourself shopping and to a movie. 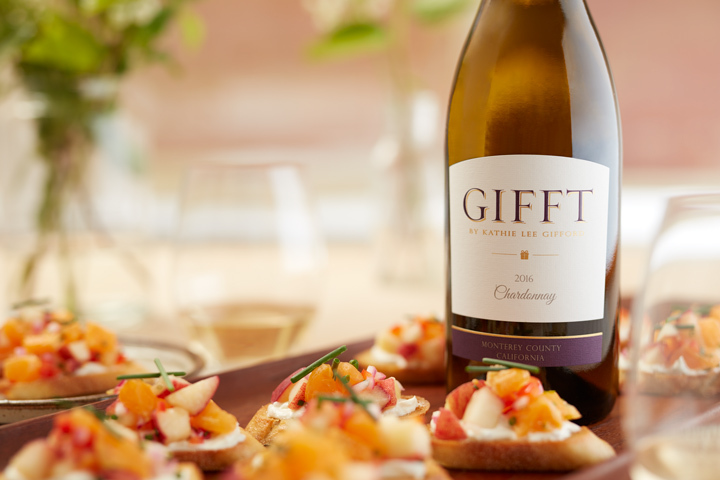 Wishing you a joyful holiday season from all of us at GIFFT Wines! 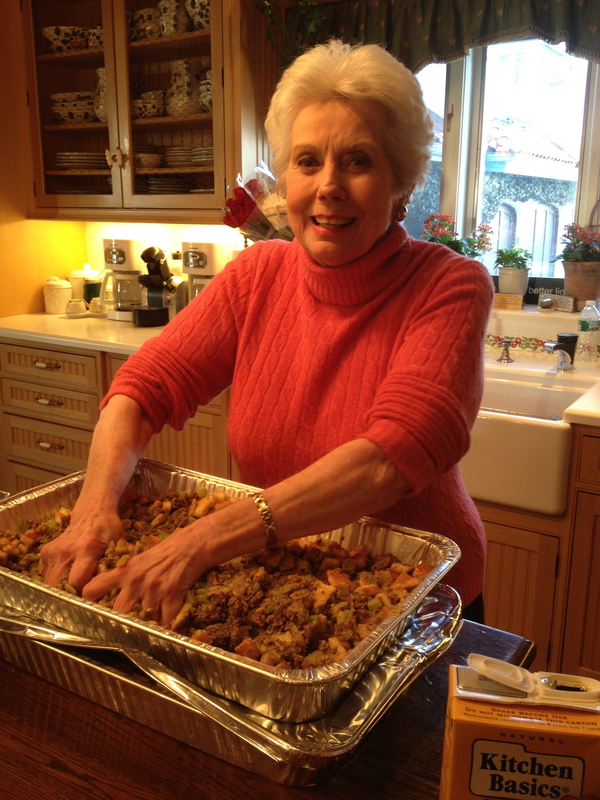 Joanie, Kathie's mother, made a sensational stuffing! Make this family recipe a centerpiece of your Thanksgiving table this year! The crisp, refreshing finish of our Rosé pairs perfectly with this stuffing, plus a wide variety of your favorite Turkey Day dishes. In a large saucepan, heat the butter over medium-high heat. Add the celery and onion for 10-15 minutes, or until vegetables are softened. In a large skillet, cook sausage over medium-high heat until cooked through. Drain the fat from the meat and discard. In a large bowl, combine the vegetable mixture, cooked sausage, and bread croutons. Add a little water to moisten the stuffing slightly. Season with sage, salt and pepper. Stuff turkey cavity and cook as directed. Bake any leftover stuffing in a buttered baking dish. "I adore Thanksgiving. Since the very first celebration in Plymouth, Massachusetts, in 1621, it has continued to be about one thing: GRATITUDE. I don’t cook much in our home throughout the year but I do try to make up for it on Thanksgiving. We start several days before the feast and I love the whole process. If I’m not covered in flour and cinnamon and sage and gravy by the time we sit down to give thanks, I have slacked off and I am not worthy of praise! I’m so grateful for the joy of family and friends and food and fellowship. Is there anything sweeter?" 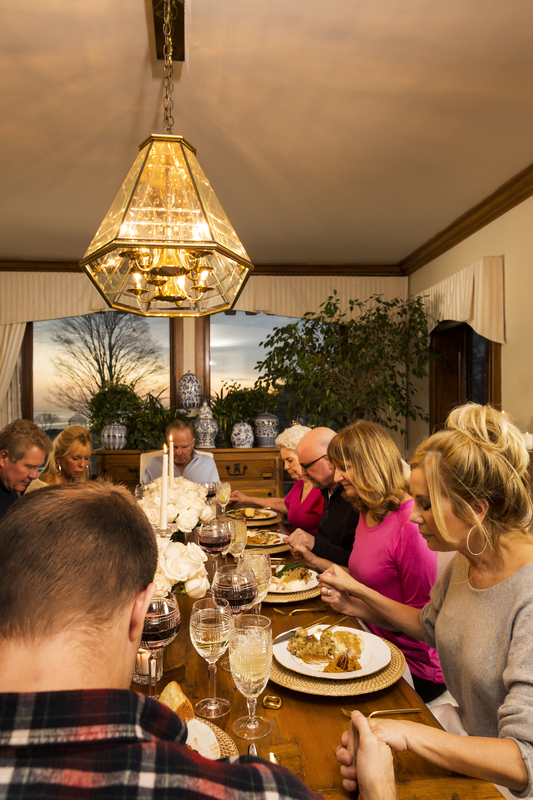 We say grace beforehand and then we go around the table individually and say what we are grateful for. 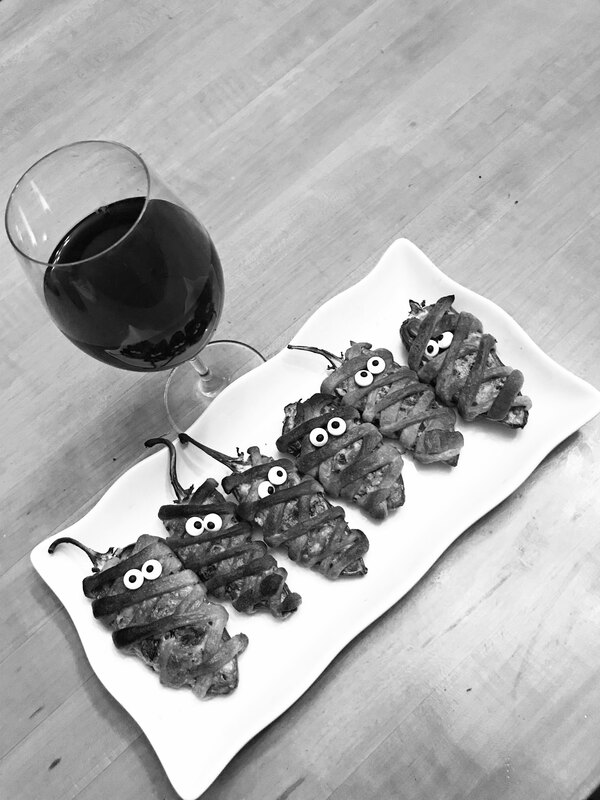 As clever as they are delicious, these Hot Halloween Mummies served with GIFFT Red Blend are perfect to snack on at a costume party or while waiting at home for trick or treaters! Preheat oven to 400 degrees and line a baking sheet with parchment paper. Slice the jalapeños in half lengthwise and scoop out the interior, including all seeds. Place cream cheese, cheddar cheese, bacon and green onions in a bowl and mix thoroughly. Fill each jalapeño half with a scoop of the cheese mixture. Unroll the sheet of croissant dough and slice the dough in thin strips. Wrap one or two of the strips around each pepper, leaving a small opening for the eye treat toppers. Bake for 15 minutes, or until golden brown and cheese is bubbling. 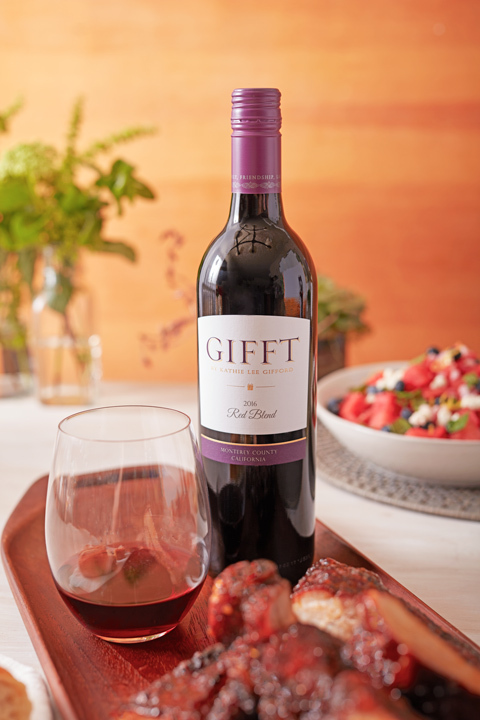 Place two eyes on each pepper and serve immediately with a glass of GIFFT Red Blend. Preheat grill to medium-high heat. Lightly brush grill with extra-virgin olive oil. Stir together paprika, chili powder, cumin, thyme, salt, garlic powder and pepper. Toss chicken thighs with spice mixture. Grill the chicken until it is just cooked through, 5 minutes per side. Whisk together vinegar and honey, and brush mixture over grilled chicken prior to serving. Preheat grill to medium heat. Mix rub ingredients in small bowl. Rub to coat evenly on ribs. Begin grilling ribs over indirect heat. Close lid and cook for 45 minutes. Flip ribs and cook for an additional 30 minutes. Combine sauce ingredients in bowl, whisking until smooth. Slather sauce over ribs before moving to direct heat for 5 minutes. Flip ribs to add sauce to the other side, cook an additional 5 minutes. Allow to stand for five minutes before slicing and serving. Preheat oven to 400 degrees. In a medium bowl, combine oranges, peaches, red pepper, red onion, lime juice and chives. In a small bowl, whisk together goat cheese and milk. Arrange bread slices in a single layer and bake for 10 minutes. Spread goat cheese on each bread slice before returning to oven and baking an additional 5 minutes. Top with salsa, garnish with chives and serve immediately. Harvest is officially underway for our 2018 wine grapes! The start of the season is happening later this year than in years past due to the mild temperatures throughout July and August along California's Central Coast. 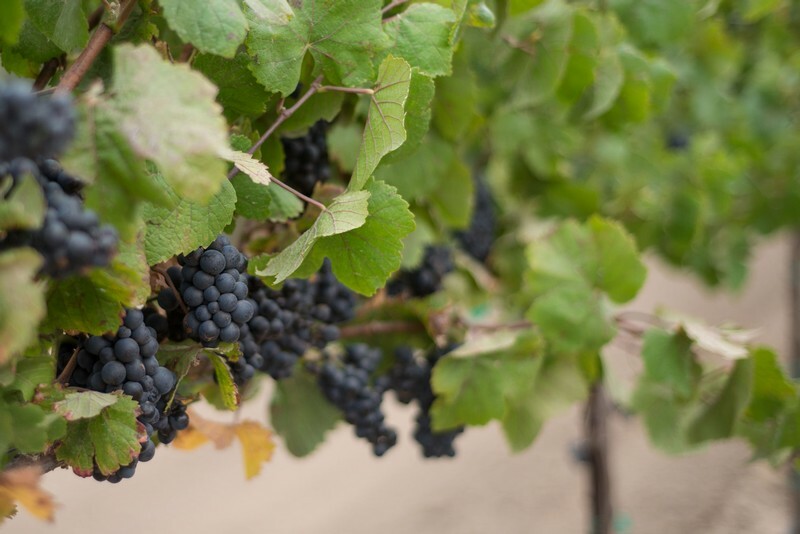 Although the last few seasons have been hot in Monterey County bringing on an early harvest, this year's moderate and cooler weather is allowing us to ease into what should prove to be a great harvest season. Monterey County is known for its microclimates, or distinctive climates in small-scale areas. Where our grapes are grown in the Salinas Valley, we’ve seen consistently cool mornings with a nice, foggy marine layer influenced by the Monterey Bay. By midday the temperatures rise, but continued wind throughout the valley keeps the vineyards cool into the afternoon. 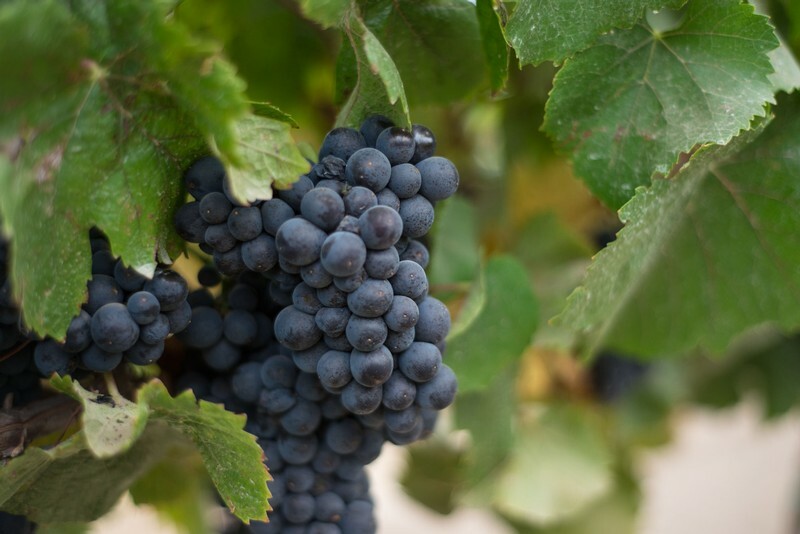 The grapes will be harvested when they have reached optimum ripeness and when it's not too hot, which means many late nights and early mornings in our vineyards. The bulk of harvest will happen in September and this year it will likely last through the end of October. Right on time! Enjoy cooking with late summer fruits and vegetables to pair with your favorite GIFFT wines. Try something new, and experiment with preparations you might not have considered! Ears of fresh sweet corn are simple to prep for a grill night in the backyard. All that's required is butter and salt! While the grill is heating to a medium temperature, pull the outer husks down to the base, stripping away all the silk. Soak the ears of corn for a minimum of 10 minutes before placing on the grill for 15 to 20 minutes, turning every 5 minutes until the kernels are tender. Serve immediately with butter. If you like things spicy, sprinkle with red pepper flakes and serve with a chilled glass of Bountiful. Fresh-picked tomatoes and peppers are perfect to use for a homemade pasta sauce, or slice on top of your salad for color and crunch! Serve our Rosé with a perfectly fresh salad for lunch, or pair with our Red Blend for a date night at home with a creamy tomato spinach pasta or penne pasta with peppers. Although delicious, eggplant parmesan is not your only option when preparing this bright purple veggie! Slice up grilled eggplant and add to a ratatouille or mash in a smoky eggplant dip to serve with pita chips or slather on lamb chops. For a tasty seasoned option, try a roasted eggplant side dish spiced up with chili paste, and enjoy with a glass of Bountiful. Cultivated since ancient times, figs can be enjoyed fresh or dried, as well as used in jam-making. Figs are in season through early October and provide a good source of dietary fiber. Figs can be added to a cheese tray or chopped into an arugula salad. Pinot Grigio would be a delightful option to serve with this dried fruit and cheese hors d'oeuvres spread or salad. Friendship, Love, Laughter... It's a GIFFT! © GIFFT Wines, Salinas, CA USA. Please Drink Responsibly.